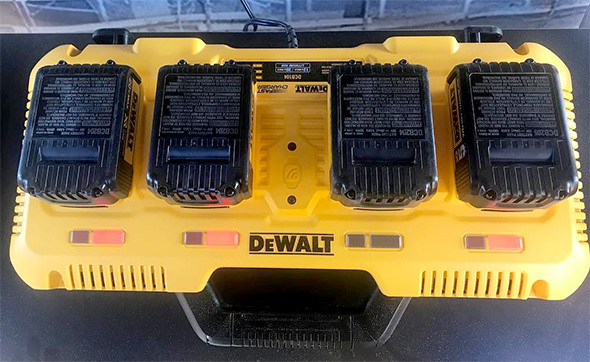 Last June we talked a little about the new Dewalt 20V Max Bluetooth battery packs. 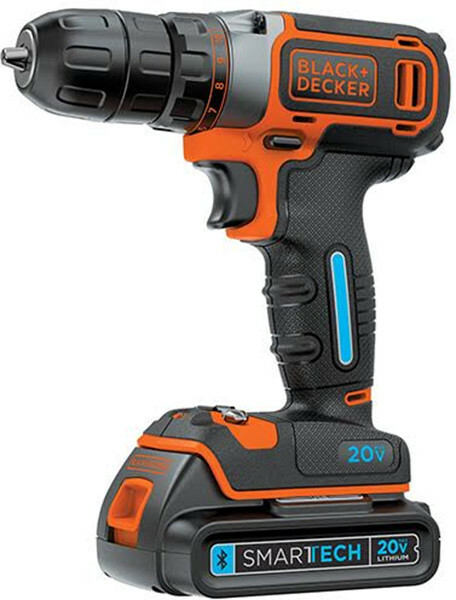 Well, Black & Decker has now come out with something similar. Meet Black & Decker SmarTech. 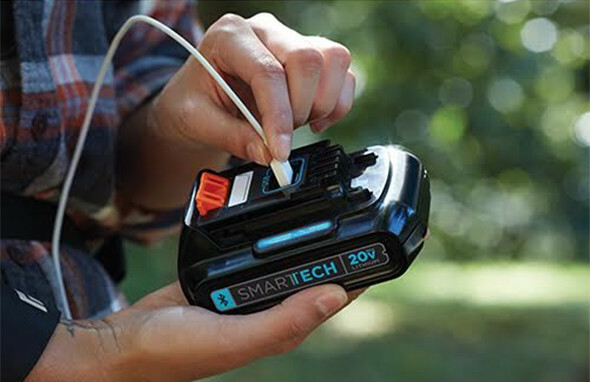 B&D 20V Max SmarTech battery packs feature Bluetooth connectivity, and will be supported by a new mobile device app. Oh, and it will also have a built-in USB charging port, a great feature for a DIYer battery pack. The free Black & Decker app will have 3 core functions: My Tools, Messages, and Projects. All of these features are straightforward, although I winder how the locate feature works. Is there a small chime that turns on, or does it work in a “hot or cold” process where the app will find a battery via signal strength. Battery notifications will come through in the Messages part of the app, and the Projects will offer tool recommendations and project inspiration. To be completely honest, I find the built-in USB charging port to be the most appealing aspect of these new SmarTech battery packs, although the locate feature could also be useful. I’m hoping that the max charging rate is at least 1.0A, but 2.0A will be better. I’ll add this spec to the feature list once I find out. The battery capacity would also be good to know. I’m going to assume 2.0Ah, because you can get (2) 1.5Ah battery packs for around the same $69 price. Update: The battery capacity is 1.5Ah, and the USB charging rate is 1.0A. It’s interesting that B&D is selling the drill kit for just $10 more than the bare battery. I’m guessing they’re looking to draw in first-time buyers and also DIYers who haven’t upgraded their drill in quite a few years. In light of the battery specs, I’m going to say that the drill kit is almost a no-brainer, and that you should possibly wait until holiday promo sales if you want a second battery (or more). Before you ask why pro-level power tool brands don’t offer built-in USB charging ports, consider how many batteries a typical professional user or advanced DIYer might have. For those users with lots of batteries, it makes more sense to pay the cost for individual slide-on USB charging adapters, rather than to pay the premium with every single new battery. I’d love to see Makita and Milwaukee adopt this idea. The Makita ADP05 cost me $26.05 and only added slightly more (2 USB Ports) functionality. I wonder which manufacturer will be the first to add USB-C to their packs. I also wonder if you could open the pack and rip out the bluetooth module to stop it from draining the pack. I’d imagine USB-C is around 1% adoption rate right now. You are going to see standard USB jacks for quite some time, and you can just buy an adapter to charge your special needs devices. Why rip it out, and not just buy a regular battery then? Is Bluetooth access really something people are clamoring for? I almost understand the Milwaukee approach since it has tool settings, but for just batteries? Any time I’ve bought a B&D tool, it’s been because I needed a really cheap tool. Their stuff seems focused on basic Home Owners more than Professionals or even Hobbyists. Maybe their market has changed without me noticing. As for the USB. It’s a $20 premium over their 2.0ah batteries, and $35 more than a 1.5ah. It’s only $5 more for a 12v 2.0ah DeWalt battery and 12v/20v USB adapter, that would then work with all your batteries. You can also buy a 5.6Ah USB Battery charger from Amazon for $20. this tech doesnt really help me as an enthusiast. Im honestly curious if a typical foreman really sees a benefit to knowing where his batteries are being used… Is this a way to monitor worker output? stop workplace theft? not sure if I get it. No foreman is going to have a B&D system anyway. Yeah, I really don’t understand the appeal here other than something that adds maybe $1 per battery to the manufacturing cost, and gives them something to put on the box for the average person buying a power tool for themselves or as a gift, for home use. “Ooh, this one is really high tech!” I guess? The current crop of B&D batteries charge just fine on a 2.0A charger and B&D sells one as a standalone. I first saw these new ones as part of, of all places, CES coverage. The M12 oddly enough is 2.1 amp while the M18 is (at least from a review) is only 500mA USB which seems very strange when the M18 should be much more capable. Though having a usb port it on the battery would be really neat and something I’d like to see more manufacturers do. Its about the only “standard” battery connector now, even EU mandates compatibly on phone chargers. The bluetooth seems pretty gimmicky otherwise. Another reason why major manufacturers don’t have a USB port built into their batteries – dust and water ingress protection. A USB adapter for the battery uses the main contacts, and doesn’t put another hole in the case. Plus, I think Stewart hit the nail on the head that pros will generally have enough batteries that they don’t want to pay for the USB option on all of them. …and Stuart, sorry I misspelled your name there. I see this as Stanley/B&D/Dewalt putting new tech into their lower tiers first and then if adopted and successful rolling it out onto the higher grade stuff. I manage commercial construction jobs and being able to know where your batteries are on site is a daily constant headache. 90% of our guys use Milwaukee and guys are constantly trying to find their own batteries that someone has borrowed or stashed in their toolbox. I counteract that by using Ridgid, because no one else does and by having a cheap Stanley drill and impact set for people who need to borrow a tool. I bet you won’t see that move to a dewalt or PC system. but I do like their Dewalt USB add on – I think that makes a lot of sense. I see others use it too. the BT battery bit – I think is only really useful for shops or contractors. do I have all my batteries? are they all in good condition? etc. for me at home – don’t give a smurf. I dont get all the bluetooth battery nonsense, I buy the tools to be used like tools,not dink with a stupid phone app.,especially in a low homeowner grade tool. The average person buying these cheap tools has no use for such things. Just another gimmick that sheeple will buy. I could see if it were like onekey where you could control torque and such for certain things cordless tools have been doing just fine without all this added useless features. Is the USB charging port for incoming or outgoing charging? What charges what here? Incoming charge would be cool. Plug it right into an outlet like a phone. As for ” interacting ” with my batteries . Does that seem weird to anyone else ? That would increase the cost, not to mention the size, and it would be slow. Huh? How would plugging it in like a phone “increase the cost, not to mention the size”? I don’t think shaping the charging hardware differently necessarily means it’ll be slower, either. Unless you’re charging with a phone charger, then yes, of course. I guess you’re dismissing the idea of these batteries taking an incoming charge via USB, so that port must solely be for outgoing charges then? Because that’s more stuff to cram into a battery pack. Maybe not a lot, but it still has to go somewhere. Plus, there would have to be another USB port for the incoming charge cable – probably microUSB. The energy capacity of a battery pack is a lot higher than that of a phone, which means longer charging times. And since there would have to be voltage conversion, that circuitry would have to go somewhere too. Every battery would cost more. 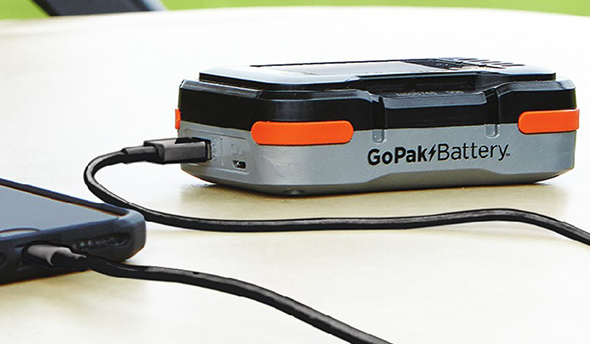 Do users really want to be able to charge their power tool batteries via USB? Some tools with built-in batteries do feature USB charging, but there’s a big difference between a 3.6V tool and an 18V battery pack. There are too many reasons against the idea, and too few for it. Energy goes from battery to USB devices, such as smartphones. Going the opposite direction would also be a nice gimmick, charge batteries with USB, the latest USB standards van provide 20Volt with 5Amps, with switchmode conversion efficiency of 90% that would mean 90watt going to the batterypack, the 18V 2Amp packs can be charged within 15-20 minutes. And with old USB 5volt, 2Amps in about 2 hours, charge with phone chargers, car power socket, laptop, solar,…. Anybody thought about a slide on cap for the regular 20 volt battery, with a voltmeter, USB and volt switchable 16 -18-19 volts for driving a laptop direct? Maybe a 24 volt input port for solar charging ? Might be too much of a Ruben Goldberg, but for remote construction areas could be real nice. Are the Max power packs and the Worx power packs interchangeable if they are the same voltage rating. Thx, just some ideas to bounce around.